Dr. Atul Gawande has written several books and articles about modern medicine. His new book Being Mortal encourages the medical community—and the rest of us—to examine the way we face the end of our lives. He writes of his own medical training: “I learned about a lot of things in medical school, but mortality wasn’t one of them. Our textbooks had almost nothing on aging or frailty or dying. How the process unfolds, how people experience the end of their lives, and how it affects those around them seemed beside the point. 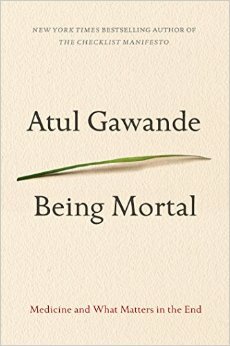 A story about a cancer patient who chose a difficult surgery over comfort care ends with Dr. Gawande writing: “What strikes me most is not how bad his decision was but how much we all avoided talking honestly about the choice before him… The chances that he could return to anything like the life he had even a few weeks earlier were zero. But admitting this and helping him cope with it seemed beyond us. We offered no acknowledgment or comfort or guidance. He writes about his daughter’s piano teacher Peg and her terminal illness: “I suggested that Peg try hospice. It’d at least let her get home, I said, and might help her more than she knew. Being Mortal by Dr. Atul Gawande brings important end of life issues and questions to the table. The fact that they are written by a leading Boston surgeon who also teaches at the Harvard School of Medicine means that these thoughts will reach the eyes and ears of many members of the U.S. and world medical community. If you find yourself suddenly the caregiver for a parent, a spouse, a partner, a sibling, you may be overwhelmed. Not only are there many new responsibilities, there is much mystery that lies ahead. Where do you go for help? Who can tell you what to do in this new role? In Passages in Caregiving, she writes about the episodes in her husband Clay Felker’s slow demise. He died in 2008, seventeen years after his first cancer diagnosis. She writes about things she learned from personal experience, as well as insight she gathered from talking to other caregivers. As we at Hope Hospice tell patients and caregivers, every situation is different. But there are common elements that exist in most end-of-life experiences. Similarly, your caregiving experience will be different from that of Gail Sheehy. But by having walked that path, she is able to share her story (as well as those of other caregivers) in a way that can provide you a better idea of how to proceed. If you are a caregiver and have questions about hospice care, call us at Hope Hospice at 314-984-9800. The results of a recent study published by Health Affairs, a journal of health policy and research, show that hospice provides significant cost reductions for patient care. This is great news for taxpayers because of the large portion of health care in the US that is funded by Medicare. Of course, we have known all along about the savings that hospice care delivers. This finding just makes it official. Earlier findings had indicated that, on average, significant savings to Medicare occurred only when a patient was receiving hospice care for at least 53 days before dying. The new figures reveal that shorter terms can also reduce average costs. Patients enrolled for one to seven days before dying saved Medicare an average of $2,650. Patients on hospice for eight to 14 days resulted in savings of $5,040. And those who were hospice patients for 15 to 30 days before death led to an average savings of $6,430 compared to hospital and other medical costs. Multiply those figures by the number of deaths that occur annually in the US. The result is savings well into the billions. With our state and nation facing multiple fiscal challenges, it is reassuring to note that ours is a portion of the health care arena where we can make a difference. At Hope Hospice, our top objectives are patient comfort and symptom control. The care we provide comes from a team of participants. In addition to our medical team (doctors, nurses, home health aides), patients and caregivers receive support from our social worker, our chaplains and our massage therapist. This means that while our work is less costly than hospital visits, the services we deliver to patients are extensive and thorough. How can you help? Spread the word. As Americans learn more about hospice, they embrace it in greater numbers. As patient numbers grow for hospices around the country, the savings to our nation’s Medicare budget also increase. For information about Hope Hospice or hospice care in general, visit our website HopeHospiceStl.com or call our office at 314-984-9800. Is The Hospice Message Getting Through? Does it seem lately that when someone talks about hospice, they are better informed? Has the general public learned that the great majority of hospice care is performed in private residences and in nursing homes, not at in-patient hospice facilities? Do they know that hospice care is covered by Medicare, Medicaid and most private insurers? Do they know that hospice is not just doctors and nurses, but other teams members as well? Increasingly, the answers are yes. How has this jump in hospice awareness and knowledge happened? More people are using hospice. Growth in hospice care organizations and in numbers of hospice patients has increased dramatically in St. Louis and across America in the last five years. As hospice delivers care to more patients, the family members and friends of those patients tell others about the work and the compassion of hospice personnel. Media members are more willing to do stories about hospice care and hospice patients. Some outlets are still looking primarily for lighter content beyond their hard news coverage. But as more media people learn what hospice is and what it does, they are more eager to tell the story. Even though hospice deals with people who are expected to die, hospice work is not all gloom and doom—a fact that media members are figuring out. The internet has, over the past decade and a half, delivered enormous amounts of information about hospice care. By utilizing hospice agency websites and blogs (such as this one), a person can obtain useful facts and opinions about hospice care and its value. The medical community, which is obliged to constantly gain knowledge about its specialty fields and general medical issues, has learned more about hospice. Sometimes this is because patients and patient families have asked doctors specific questions about hospice. Hope Hospice knows that there is much work yet to be done in informing Americans about hospice and its value. We can’t stop now. But we can take just a moment and rejoice in the fact that efforts to inform people about hospice are moving ahead. A front-page article in Sunday’s (6/24/12) St. Louis Post-Dispatch told the shocking story of a local woman who spent six months in and out of hospitals and care facilities, obtaining treatments for the various maladies that led to her eventual death. The story pointed out the total bill for her medical care was $1.16 million dollars! Shouldn’t there have been some mention of hospice as a less costly alternative to in-patient hospital care? The article was timed to run just before the expected Supreme Court decision on “Obamacare.” The article contained a good deal of timely, important information. And the writer, Jim Doyle, may have wanted to focus primarily on the specific issue of spiraling costs of hospital stays and services. As “Sixty Minutes” pointed out in a segment titled “The Cost of Dying” that aired in 2009, huge amounts are spent on treatments that are often unsuccessful. We are blessed in St. Louis with some of the best medical personnel and facilities in the US and we applaud their great work. But, as the Post-Dispatch story and the “60 Minutes” piece point out, the costs of care for elderly patients are skyrocketing. Should there be more discussion of hospice care in doctors’ offices AND in media coverage of the healthcare? We think so. Many patients and families have found hospice care preferable to going in and out of the hospital, with cost not even considered as a factor in those feelings. But the truth is hospice care is less costly than hospital stays. Had the woman in the Post-Dispatch story been in hospice care, her final months may have been more comfortable for her than described in the article. The story mentions that she spent only 22 nights at home during her six months of treatment. Had she been a hospice patient, she could have, presumably, spent every night in her own home. The real value of hospice care to the patient is the pain management that hospice provides. The real value of hospice care to those of us who fund Medicare is the efficiency and less costly expense of hospice care. In 2011, ABC News reported that the amount Medicare pays hospice care organizations had increased 53% from 2005 to 2009. The main reason, says the report, is the number of patients using hospice also increased significantly. The amount that Medicare paid hospices in 2009 was over $12 billion dollars, according to the ABC News report. That’s billion with a “B.” That’s a lot of money. That’s a figure that gets attention. “For every patient admitted to hospice, it saves approximately $2,250 compared to patients with similar illnesses not admitted to hospice care,” said Schumacher. Yes, Medicare spending on hospice care has increased because more people are using hospice. More people are using hospice because more people know about it and have been told about its benefits. Because more people are using hospice instead of spending time in hospitals, hospice is actually saving the government money! ….the rest of the story!